Stuart Nathan for The Engineer: One possible vision of the future could be taking shape at Siemens Robotics Labs at Princeton in New Jersey, where a team of engineers is developing autonomous robots equipped with vision, processing and additive manufacturing systems, designed to cooperate on additive manufacturing tasks. 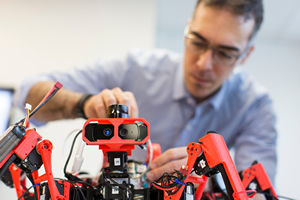 In the form of robotic spiders, the systems are aimed at applications such as collaborative manufacture of automotive bodies, ship hulls or aircraft fuselages, explained project leader Livio Dalloro, head of Siemens Product Design, Modelling and Simulation Research Group. Like several concepts in mobile additive manufacture, the Spider bots grew out of a concept to build bases for exploration on the Moon and other planets.